The Vogue is in its ninth season and is available in either Pro (orange) or HD (blue) construction, the difference being the use of wide spaced 6mil x-ply in the HD’s window as opposed to monofilm. Tall and relatively narrow in outline, the Vogue has undergone some major refinement, with careful consideration given to the material used in each panel and a second inset clew for more control and manoeuvrability. Rigged on one of RRD’s Dynamic Pro C100 masts, it was easy to sheath and set the sail, thanks to the guide provided in the upper panel of the sail (RRD call it their Integrated Trim System), choosing the upper eyelet for power or lower inset eyelet for control. There is a good deal of luff curve in the Vogue, the lower two battens displaying a moderate profile, whilst retaining rotation around the mast whatever the set. 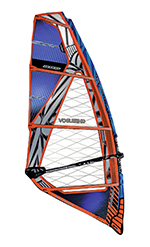 “Our most refined wave sail thanks to the extensive work of Andrea Rosati and Vice-World Champion, Alex Mussolini. This year thanks to the new “Performance construction” we shredded a precious 300g off the sail, with the majority of that saving up high where it is most noticeable. Also the addition of the Power Clew system gives 2 positions for the outhaul, giving a boost of power in the outer eyelet and ultimate control on the inside. The already versatile Vogue just got even better.” John Skye, Sail Designer. On the water, the Vogue Mk9 initially feels smaller than its quoted size, the short boom length (even on the upper eyelet) and moderate forward-driving profile providing subtle, delicate feedback through the hands. It is quite a taut sail, the high skin tension in part responsible for the sail’s handing (more on that later), yet it masks over the Vogue’s capabilities in marginal winds. Under minimal tension, the sail feels a little stiff and unresponsive at first, yet provide a few timely pumps and the narrow Dacron luff panel works with the stretch in the luff sleeve to inject some life and energy. Settling into a comfortable upright stance, the high tension and larger x-ply luff panels then take influence over the sail’s character, bestowing the Vogue with a very crisp and responsive feel. It is also certainly fast, and readily translates any extra power from a gust into more acceleration. Happy fulfilling a bump and jump role, it offers the composure and impetus to charge confidently around a break and aim purposefully for stunt ramps on the horizon. 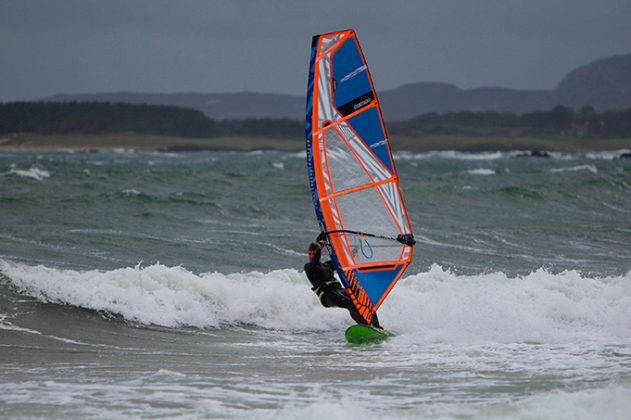 On the wave, the Vogue provides plenty of dependable low down drive through the bottom turn before the draft returns to a shallow profile as the sail is sheeted out, to enable easy adjustment at the critical moment. It was a lot of fun to use and helps to grow the rider’s confidence with every session it is used. When the wind increases, the Vogue has ample tuning range to cope, the option of the lower inset clew eyelet also undoubtedly playing its part. It offers an excellent balance of precise performance and comfort to tackle varying conditions and satisfy the most demanding manoeuvre-oriented riding style. Boasting plenty of both natural and tuneable range, the Vogue continues to impress. With crisp handling and a precise power delivery, it has just enough built-in softness to provide the comfort to really exploit real-world conditions.